UK based manufacturer Cartec Audio have launched their own 500 series enclosure, the Compere 500. It is 19-inch rack mounting as standard, with a total of eight slots. An internal heavy duty power supply provides up to three amps per rail. The Compere 500 has assignable front panel input XLR, in addition to eight input and output XLRs for each module slot. Users will be able to act as ‘compere’ and introduce the front panel input signal to any one of the eight modules via the front panel aux to input module rotary switch and associated +48v phantom power switch. This is intended to provide uninterrupted phantom power when switching to different pre-amp modules. The aux to output module rotary switch selects which module carries the output and audio appears on the dedicated rear-mounted routing section output XLR socket. 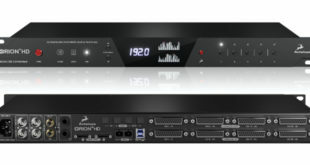 This enables users to quickly plug something into the front of the rack – or the dedicated rear-mounted routing section input XLR – and make comparisons with different pre-amps, compressors or EQs. The regular module’s XLR I/O path is defeated while the Aux Compere function is activated for that module. In addition, at the rear of the rack each module slot has a link switch which routes the output of a module into the input of the next module slot to the right. Each Compere 500 will ship complete with four blank modules.